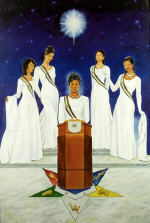 The Order of the Eastern Star was designed to serve among women the same purpose as that of Free Masonry among men, and to provide the Free Masons with cooperation of women kindred without accepting them into the Lodge. The principles are personified by five stories of women taken from the Bible. They are fidelity, obedience, loyalty, truth and heroic endurance personafied by Adah, Ruth, Esther, Martha and Electa. The purpose of this site is twofold. One, we hope to be able to help those who have an interest in the Order of the Eastern Star find out more about it and how to join. Two, for our members, we're here to help and give you additional resources for information. To begin, just click on the topic that interests you from those listed to the left. We hope you'll find these pages helpful and interesting. Thank you for stopping by. Let us Know you Dropped By. Please Sign Our Guest Book. The Sisters of Dorothy Riley #189 Thank You for Visiting!! !